Fancy your very own battery powered Bat Signal? 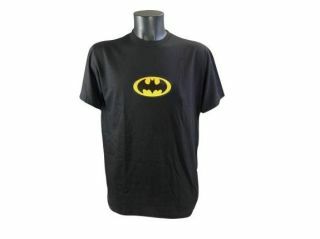 Well now you could have a geektastic T-Shirt offering an 'electro-luminescent' bad symbol, as critically acclaimed Batman film The Dark Knight hits the cinemas. Thumbs Up's new apparel offers the iconic Batman logo (or the Joker) with the added bonus of a small battery pack that allows the graphic to light up. The press release say that the 100 per cent cotton T-shirt houses "a flexible panel on the front of the shirt to give amazing effects, ranging from a gentle glow to a pulsing strobe. Great for night time parties, clubbing or to just attract some attention!" It's officially licensed from rights owners Warner Bros (and therefore DC Comics approved), and is available now from Forbidden Planet.